Pan-regional constructions in the Indian Ocean are of relatively recent origin, are contested and remain relatively weak at present. Sub-regional constructions, on the other hand, have tended to be more focussed, especially in terms of security, and have generally been more successful. The principal purpose of this volume is to critically evaluate the debates surrounding these issues and to elucidate some of the main strengths and weaknesses of regionalism at both scales. The discussion begins at the pan-regional scale with an evaluation of pan-regional contestation, followed up by a chapter on the main pan-regional grouping – Indian Ocean Region-Association for Regional Cooperation (IOR-ARC) – which was renamed Indian Ocean Rim Association (IORA) in 2013. Thereafter, key examples of sub-regional groupings – South Asia, ASEAN, SADC and GCC – are critically discussed in turn. The principal readership for this volume will be: scholars of geography, politics and international relations; students of Indian Ocean studies; regionalism experts; bureaucrats and politicians both within and outside the Indian Ocean Region who wish to gain insights into Indian Ocean matters; scholars who appreciate a view of regional relations ‘from the inside’. 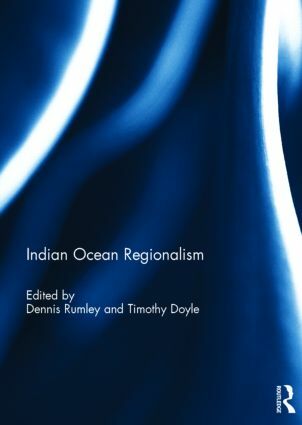 This book was published as a special issue of the Journal of the Indian Ocean Region. Dennis Rumley is Professor of Indian Ocean Studies, Curtin University, Western Australia. Professor Rumley is Chair of the Indian Ocean Research Group (IORG), which is an Observer to the Indian Ocean Rim Association (IORA). He is Founding Editor of the Journal of the Indian Ocean Region. Timothy Doyle is Professor of Indian Ocean Futures, Curtin University, Western Australia. Professor Doyle is Australia’s Focal Point on the Academic Group of the Indian Ocean Rim Association (IORA). He is Chief Editor of the Journal of the Indian Ocean Region.